5/5/12 - Theft - Ajaccio, Musée Fesch - The four paintings which had been stolen from the Musée Fesch in Ajaccio, Corsica last February 2011 (see news item of 19/12/11) were recovered on the evening of 4th May 2012 in a city parking lot, after the investigating magistrate was notified that the works had been left there (the official version states that an anonymous phone call was received). Philippe Costamagna, the museum director, has still not been able to see the paintings (when we went to print) as he was not in Ajaccio at the time. He confirmed to us that they were in perfect condition and would be hung on Monday in the presence of Marie-Christine Labourdette, director of the Musées de France. "I am pleased to see the return of these works which are a national treasure," he added. "I was sure we would eventually find them, but I thought it would be either immediately after the theft or else after several years. A little more than a year later, is unusual, but finally, not long at all." 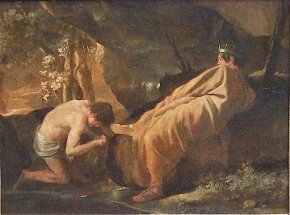 Besides King Midas at the Source of the River Pactole by Nicolas Poussin (ill.), the paintings include three Italian panels : a Virgin with Child by Giovanni Bellini, a Pentecost by Mariotto di Nardo and a Virgin with Child in a Glory of Cherubim by a 16th century anonymous Umbrian. This affair should serve as a lesson to art robbers that this crime does not pay, at least in the case of museum objects or items which are sufficiently important and well-known, making it impossible to negotiate them on the art market. This fortunate ending comes shortly after two of the four canvases (a Degas and a Cézanne) stolen from the Bürhle Collection in Zurich were also recovered (see news item of 13/2/08). The two others (a Van Gogh and a Monet) had also been found just a few days after the theft.